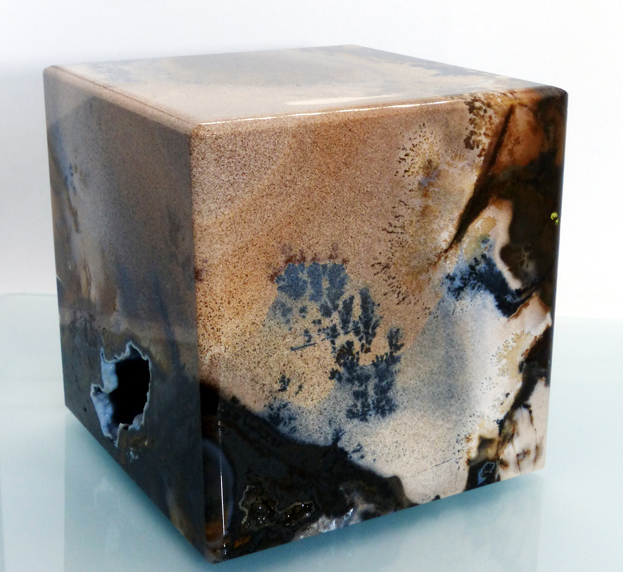 Large Polished Cube of Moss Agate with pockets of Chalcedony Druzy. Measures 3-1/8 inches on sides. From the Sharly Mine, Bek Pakdala Desert in Karaganda Oblast in Kazakhstan. (rrstn-19-01) $1,100 Available from our West Coast Office Only. Roman Bronze (approx. 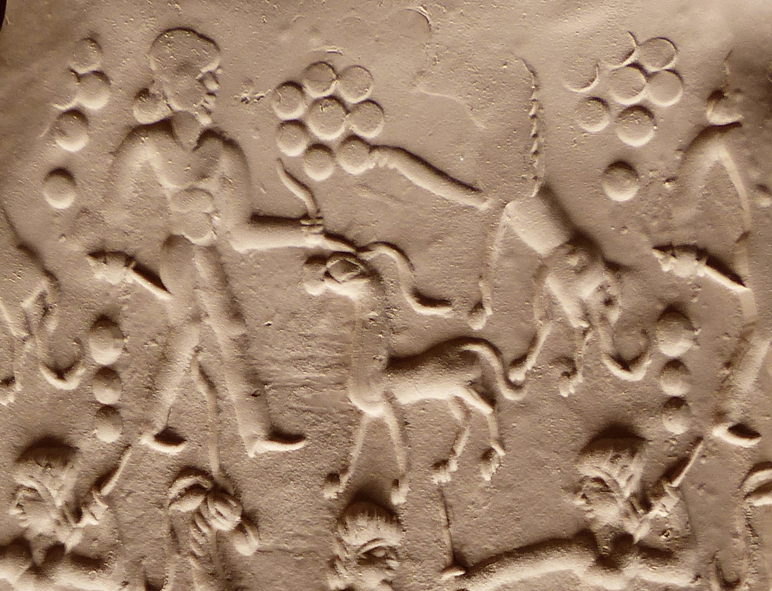 300BC). 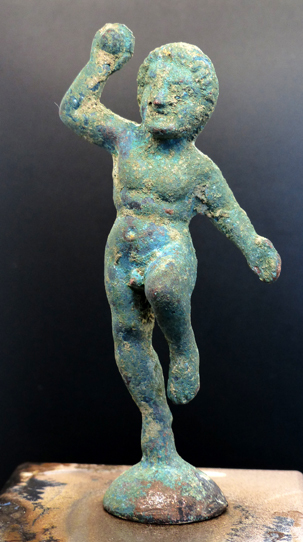 Said to depict Cupid, but posssibly a Roman athlete playing the ball game of Harpastum, as one can clearly see what looks like a ball in the palm of his right hand. 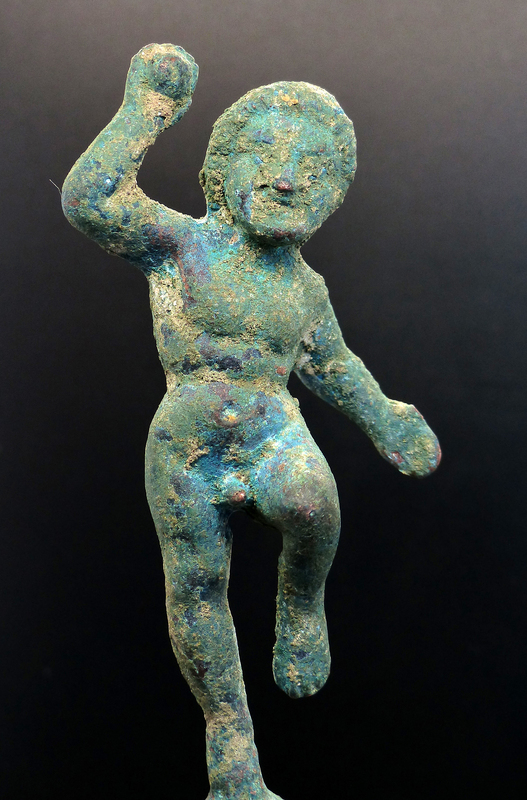 Found in Northern Jordan back in the 1980s along with some other small bronzes. Measures 4-1/2 inches high. (ja-19-04) $1,975 Available from our West Coast Office Only. 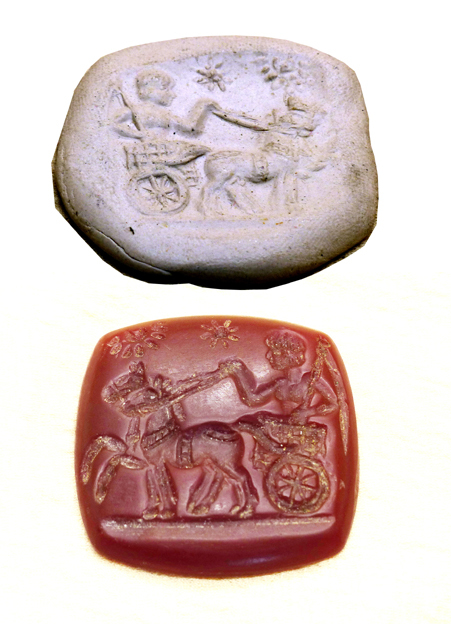 Chaledony Seal showing warrior with shield, in a chariot drawn by a pair of horses, with not only the sun in the sky but an Aegean Greek Star - superb image! "Regarding the Aegean Star - typical star displayed in Greece, Alexander The Greats time, mentioned several times in the Trilogy of Alexander the Great written by Maximo Manfredi, an Italian writer/antropologist who wrote three books." Research on line shows a Vergina Sun Symbol, with various number of rays, and also called Macedonian Sun or Argead Star. More research could be done to obtain more info, as two images appear in the sky and one would be the sun and the other perhaps a Star observable during the day due to an astronomic event. Hellenistic Period about 300BC - the time of Alexander the Great. 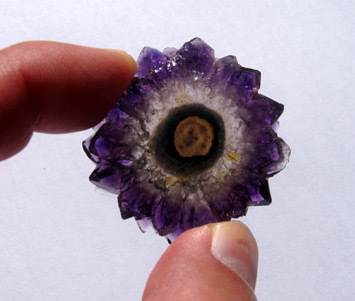 Thought	to have originally been part of a pendant. 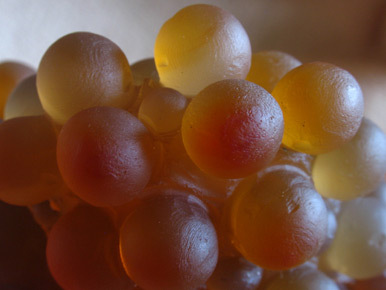 Measures approximately 48x48mm. (ja-19-01) $750 Available from our West Coast Office Only. 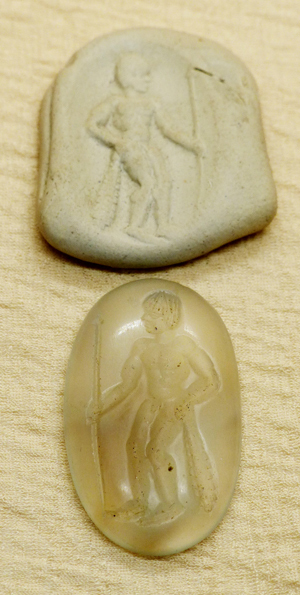 Roman Seal, said to be Hellenistic Greek Period, approx 300BC, depicting Hercules. 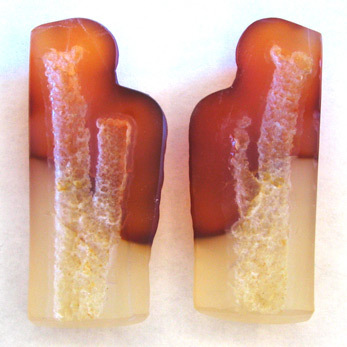 Mostly likely from a ring and carved in what is believed to be Agate. Measures approximately 35mmx20mm. (ja-19-02) $600 Available from our West Coast Office Only. 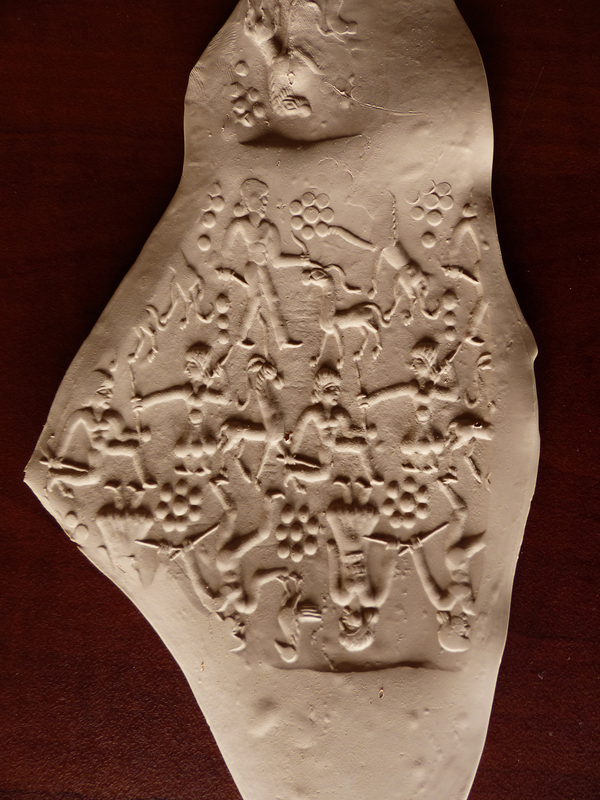 The largest cylinder seal we have seen, fashioned from Agate and depicts what is believed to be a hunting scene. 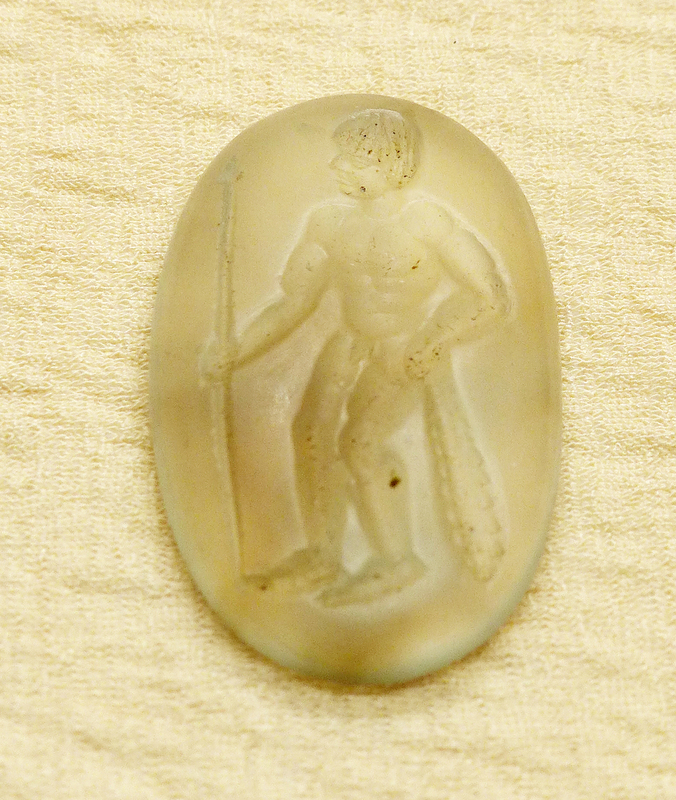 Said to be from Bactria (Persia), circa 500 BC. Measures 4-1/2 inches high. 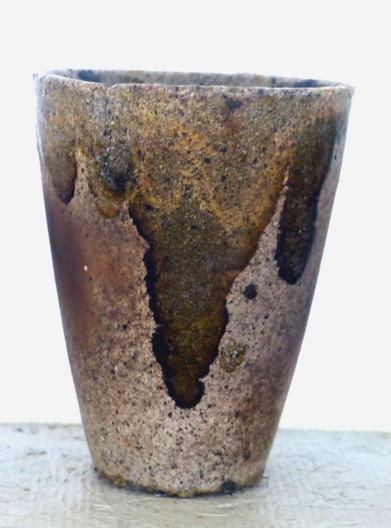 We actually had to purchase clay to view the scene from this large cylinder but we were not disappointed. There are 3 human figures through the piece, all dressed differently. All appear to be holding weapons, knives, swords or similar. There seems to be deer or a type of antelope, and one image of what appears to be a falcon or other raptor and quite possibly on the arm of the person to its right - therefore, this seems to indicate the raptor is being used to hunt. Also, there is another animal that seems to be a lion, with a mane and long tail, with a paw extended towards a figure to its left who holds a knife. Due to the size of the cylinder, it is very difffult	to obtain a crisp image of all the incised areas present, as one must apply the proper pressure, speed, etc. With some time, and some trial and error, one should be able to obtain a nice impression of the whole seal in one roll. 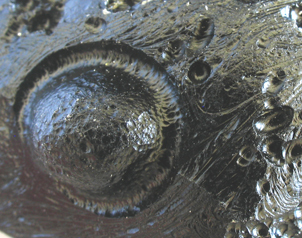 The raptor/falcon is more detailed than shown; insufficient pressure was applied to obtain the detail. 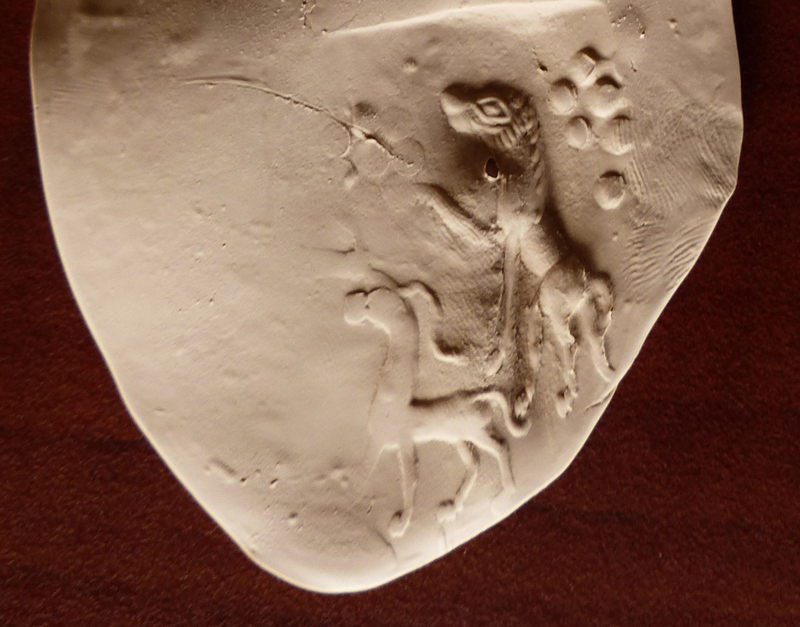 This is also the case of the lion, but we did press that section into the clay on the bottom and there is a better image of the head but the body/tail is lacking in that impression. 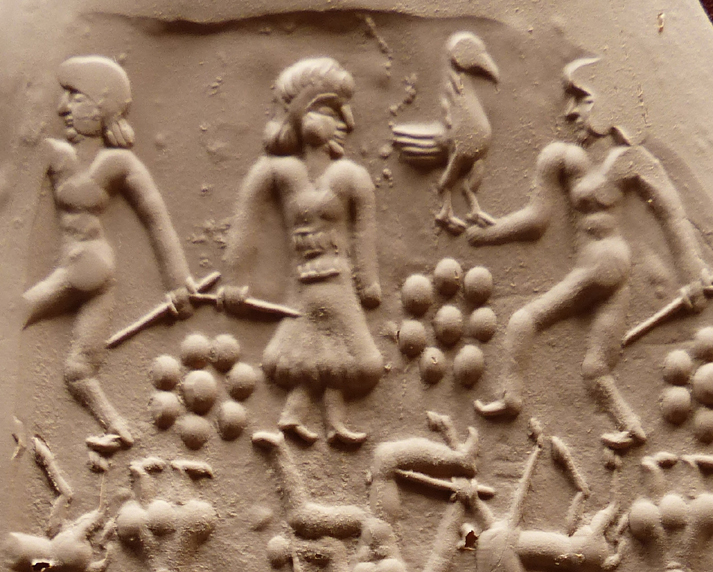 Various large images of this cylinder seal may be seen below. 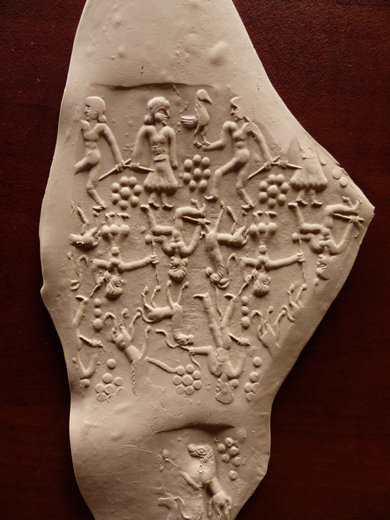 After the impression was made in the clay, it was heated, so this hard clay table with the image of this scene will accompany the sale of this special cylinder seal. A Very Rare Piece with a beautiful scene. (ja-19-03) $1,500 Available from our West Coast Office Only. Wollastonite Skarn from Primorye (Primorsky)Region, Dalnegorsk - Russsia. 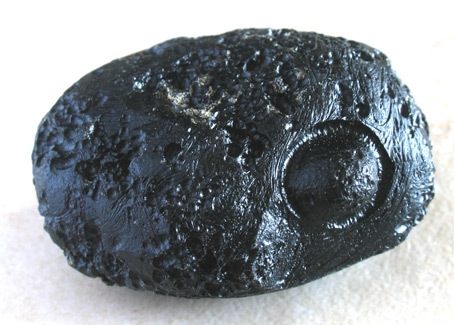 (Skarn is a metamorphic rock that has been chemically and mineralogically altered by metasomatism. Wollastonite is a common mineral in skarns or contact metamorphic rocks. 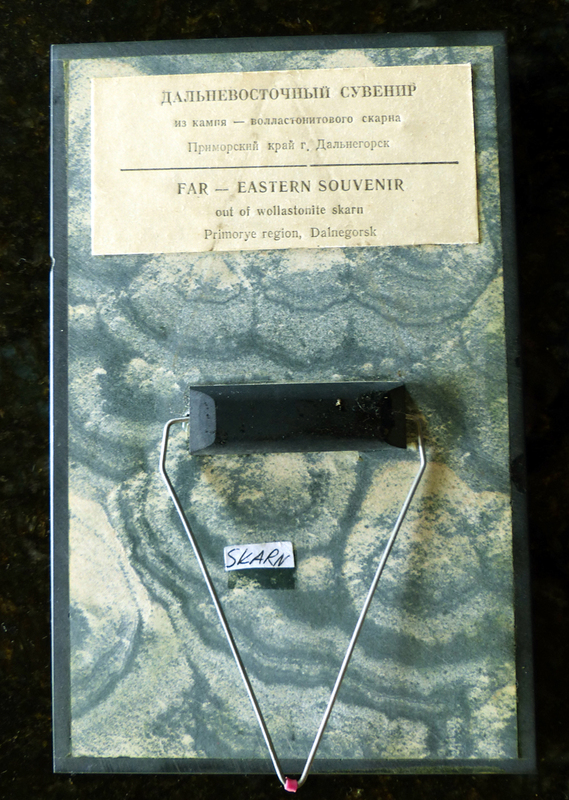 Skarns can sometimes produce some wonderfully rare and exotic minerals with very unusual chemistries. 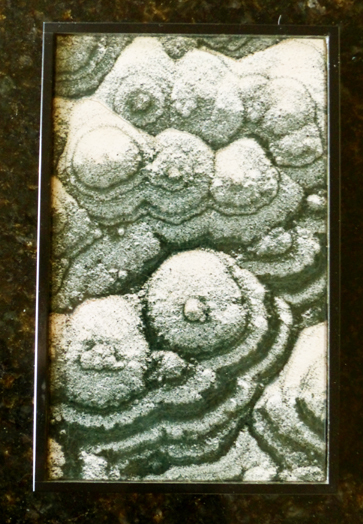 Wollastonite forms from the interaction of limestones, that contain calcite, CaCO3, with the silica, SiO2, in hot magmas.) 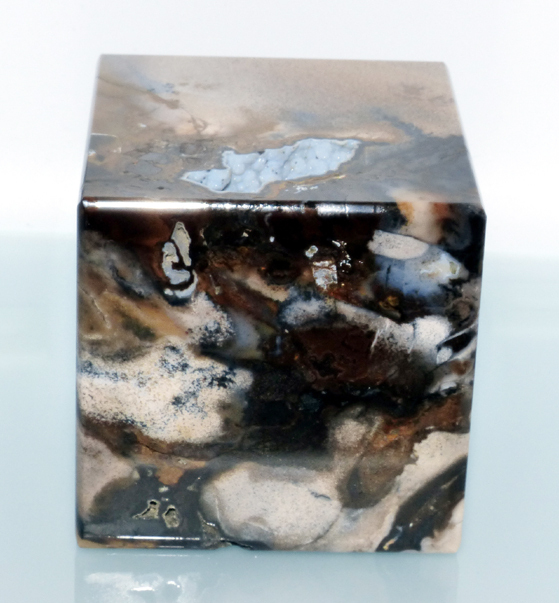 The deposit that produced this natural work of art, was said to be active about 40 years ago when this piece was mined/polished. 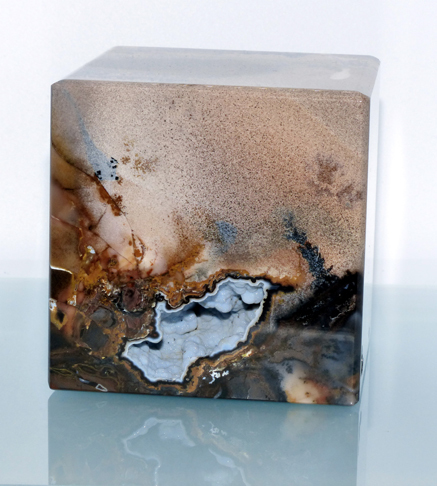 This unique 7"x4.5" plaque is surrounded by a black polished mineral border. The natural design consists of black and what seem like a very light beige to very light green depending on lights. 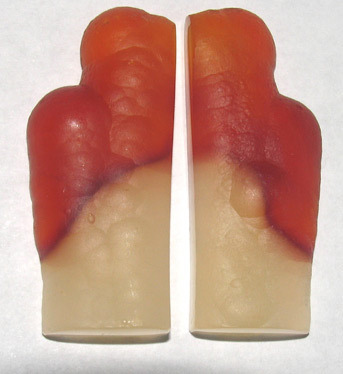 The darker yellow color seen on the left had side is a shadow. 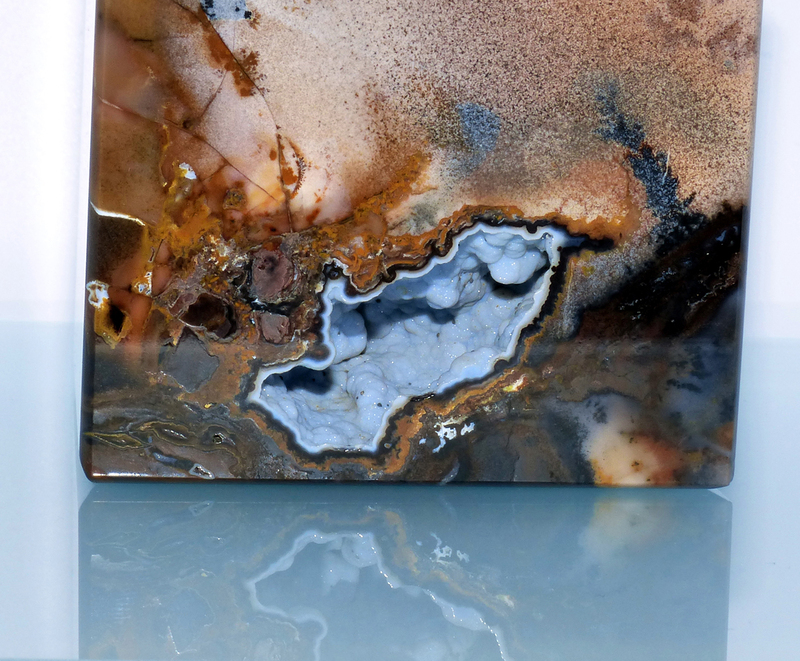 Incredibly beautiful and certainly looks like a design that an artist has created, but it is entirely natural - only polished! 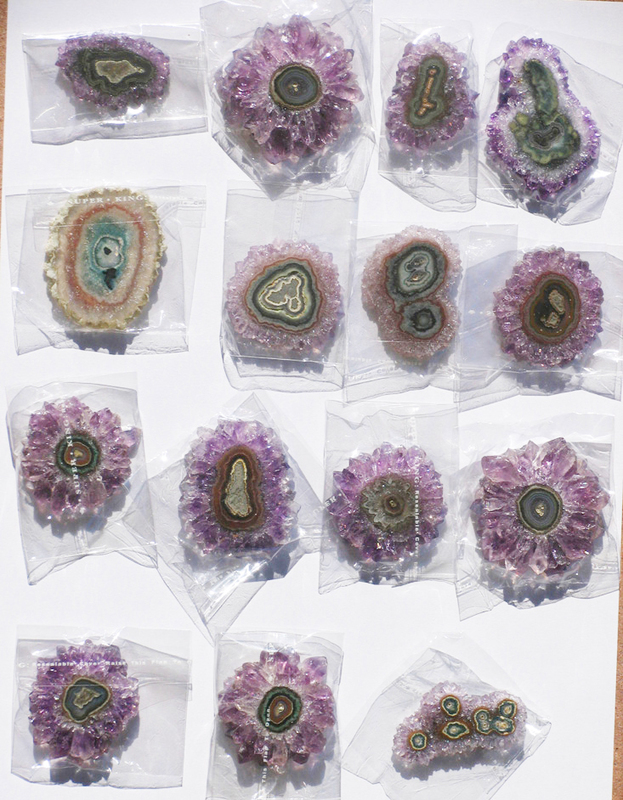 These uncommonly beautiful natural occurring mineral slices are frequently purchased by collectors due to the designs, colors, etc. and may see very high prices. 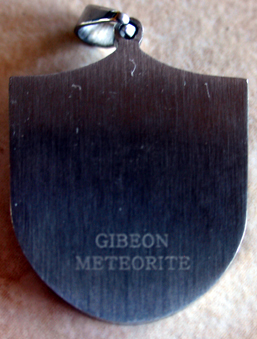 Like many gemstones, these unique plaques can be very indivualistic and are rarely seen and not often available on the market. 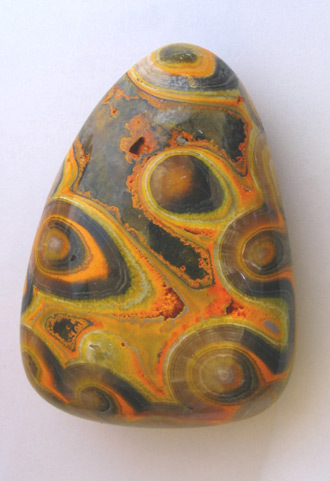 In 40 years in the gemstone/mineral business, All That Glitters had never seen an item such as this and the color as well as the design was fascinating enough to be placed into the All That Glitters inventory. Currently hanging in the All That Glitters West Coast Office and only available when in this particular office. (geork-19-01) $1,029 Available from our West Coast Office Only. $250 - Mint Condition; previously priced at far more!... Rare and hard to find uncancelled and in this condition with all the authorized signatures, gold embossed seal, etc. Click on the images above to see larger more detailed photos. THIS IS AN ORIGINAL TOBACCO CADDY LABEL This label was printed during the 1880ís for the intention of being pasted on a crate or barrel of tobacco. Caddy labels are one of the best examples of early color printing in a large format. APPROX. 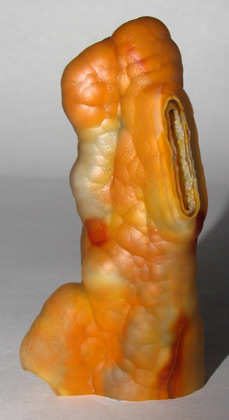 SIZE(inches): 6.75 x 13.50 inches APPROX. 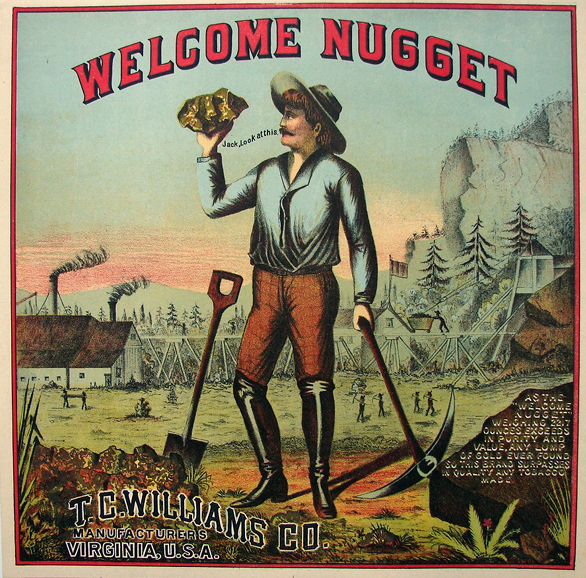 AGE: 1880-1900 DESCRIPTION: Image of miner holding the famous welcome nugget from Australia. CONDITION: Mint ORIGIN: Virginia SHIPPER/GROWER:T. C. Williams Co Someone we know encountered a hoard of Tobacco Labels back in about the 1970s. They were stored by the printer in a warehouse in the SC area of the US and they printed all kinds of labels. 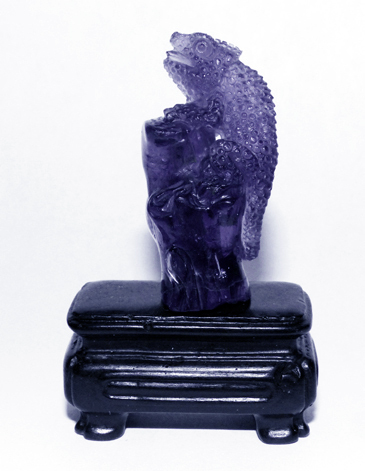 For those in the jewelery/gemstone trade, the mining ones are of interest. We have a few of these matted and framed and hanging in our headquarters office. 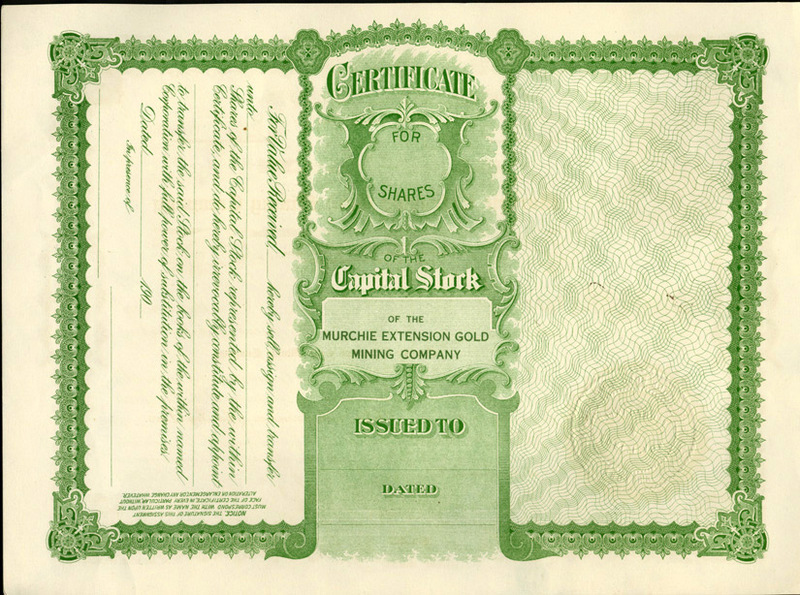 These are ORIGINAL and from about the 1880's time frame; believe it was printed using the stone lithography process. Super for framing for a store, office or home and it is a genuine original label and not a copy! We have two matted, ramed and hanging in the All That Glitters office! A few years ago, items like this were selling at $300 at auction (not online, but auctions houses) - current value unknown. $225 including shipping/insurance. (Note - U.S. Shipping Only; Inquire for International Shipping.) (tlm-14-01p) Two Available. THIS IS AN ORIGINAL TOBACCO CADDY LABEL This label was printed during the 1880ís for the intention of being pasted on a crate or barrel of tobacco. Caddy labels are one of the best examples of early color printing in a large format. APPROX. 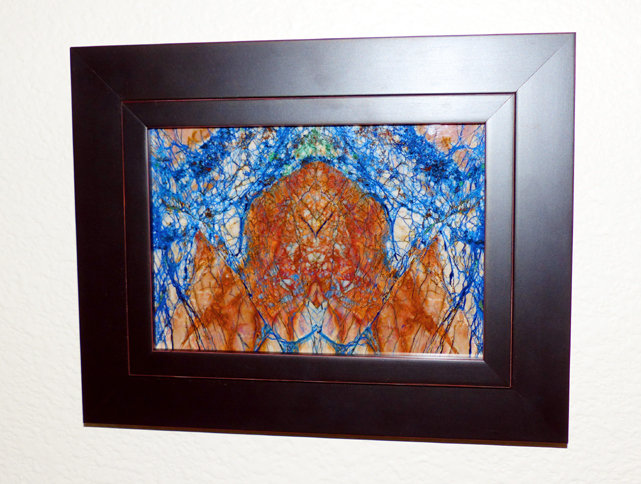 SIZE(inches): 10.75 x 10.75 inches APPROX. 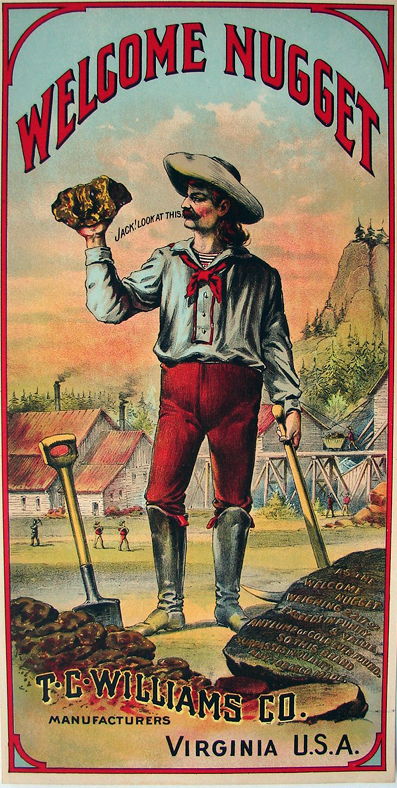 AGE: 1880-1900 DESCRIPTION: Image of miner holding the famous welcome nugget from Australia. CONDITION: Mint ORIGIN: Virginia SHIPPER/GROWER:T. C. Williams Co Someone we know encountered a hoard of Tobacco Labels back in about the 1970s. They were stored by the printer in a warehouse in the SC area of the US and they printed all kinds of labels. 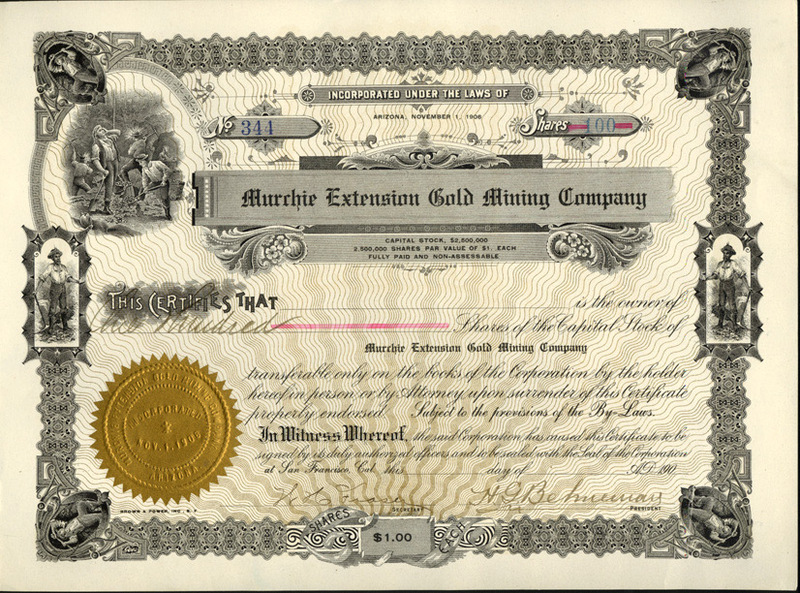 For those in the jewelery/gemstone trade, the mining ones are of interest. We have a few of these matted and framed and hanging in our headquarters office. These are ORIGINAL and from about the 1880's time frame; believe it was printed using the stone lithography process. Super for framing for a store, office or home and it is a genuine original label and not a copy! We have two matted, ramed and hanging in the All That Glitters office! A few years ago, items like this were selling at $300 at auction (not online, but auctions houses) - current value unknown. $225 including shipping/insurance. (Note - U.S. Shipping Only; Inquire for International Shipping.) (tlm-14-02p) Two Available. 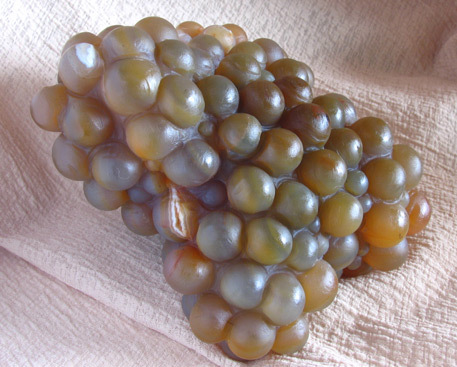 The 'Grapes" seen below are actually said to be Brasilan Agate, but carved into bunches of grapes in China! Unique and Unusual, and obviously very time consuming to create. 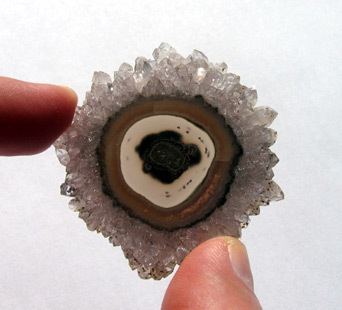 There were shown to people who are in the mineral trade with many people believing that this was a new form of previously undiscovered growth of Agate. 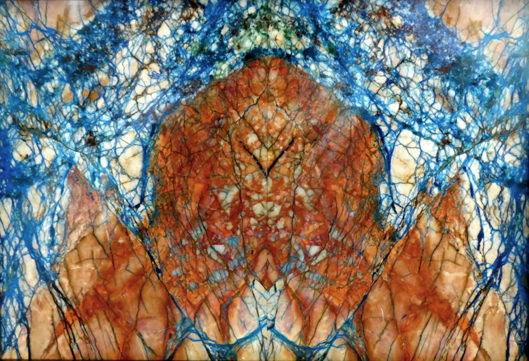 The author of a book on Agate easily identified this material as he had seen it before in the past. 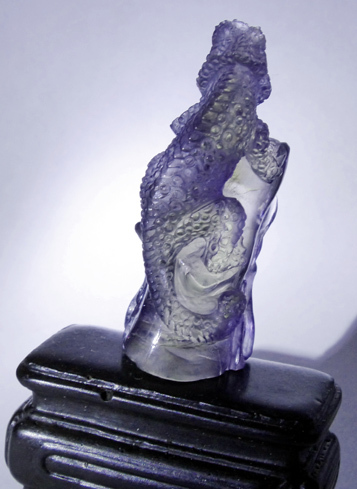 For a collector to place on a desk, within a curio cabinet or even on a table with true grapes or other fruit, this is something that is not commonly seen. The average weight of these pieces is about 2 pounds each! 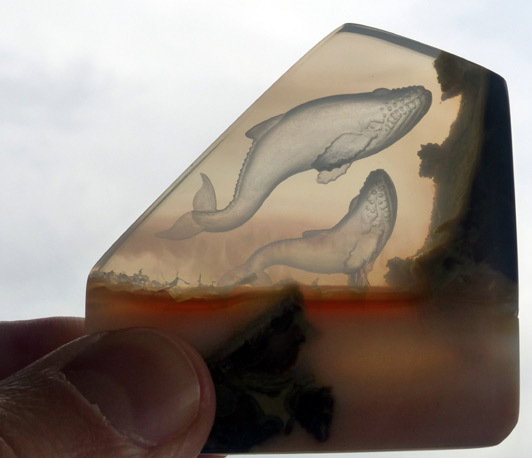 This is Incredibly Rare and One-of-a-Kind Naturally Forming Fossilized material. 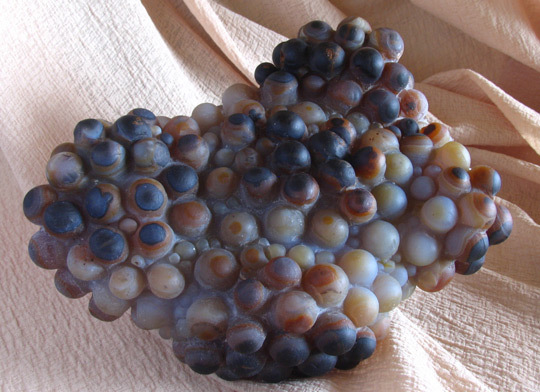 Found in Indonesia in very limited quantities, it has been identified as being either Bamboo or Reeds (via lab anaylysis), which became fossilized with layers of colorful Agate. 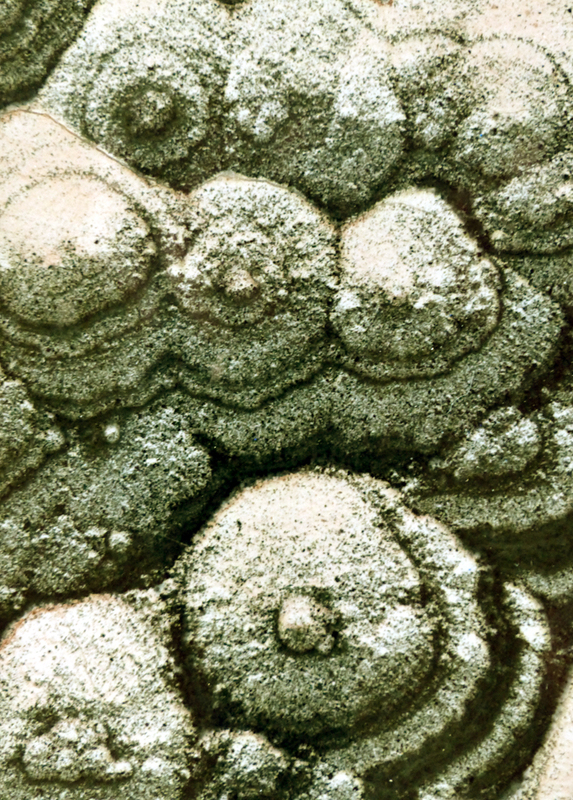 When sliced, you can see the original organic living shape of what has become Agatized over millions of years. 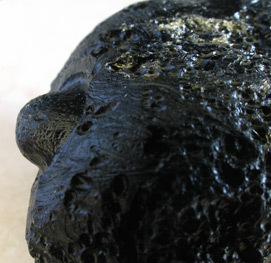 We have heard they are no longer finding this material, and that it was being found in a volcanic area in Indonesia. (clmsh-12-01c) $500 for the pair. If you would like only one of the pair, the price would be $300. (approx 2" long) Note that you can see the original organic matter shape in the right hand photo which seems to be either bamboo or reeds!